Yedo [now Toyko]. August 19 : Returned from Yokohama yesterday morning. Much that was pleasant in my stay. Let the cloak of charity fall softly over all that was unpleasant and disappointing in what occurred and what I learned of the character of others. Let me ever be learning this more and more thoroughly that there is no good at all in us, and only by the indwelling of God’s spirit and grace may any one hope to live a high, pure, holy life….The daughter of Okuno [Okuno Masatsuna, a former samurai, and an important member of the Bible translation committee] taught me Japanese, and I was much pleased with her. Her father said many thanks to me for employing her and paying her so well, as she did also herself….But I am so glad to be back in the quiet of my own room again, with my dear good friend [David Thompson] so near. Our talks yesterday so happy, so free, so satisfying. Ah, how should I thank God for these pure joys of earth so akin to those of heaven! How I do thank him! My teacher, Konai, came today. Mr. Thompson had arranged with her to do so. She promises to be a great help to me. I hope I may help her too. She is a professing Christian. She may be fitted to do noble work for her heathen sisters. Everything seems sent to make me happy, and I am very happy today. O God let me ever rest in the rich sun-light of thy love. August 20: I was much pleased with my own teacher today. We had an earnest little talk on religion. I hope to have many such, and instruct her in the way of life as I can. August 26: The mail came yesterday bringing me eight letters and six papers. O how happy I was in reading the loving words….The ladies of the Savannah Missionary Society wish to correspond with me regularly, and Tibbie wrote the first letter….But Mr. Thompson got no letters. In the evening, a long troubled talk with him. And so, the grateful day ended in sadness. August 28: A weary night last night was, sleeping with Mrs. C. [Julia Carrothers], for I could not sleep while fleas were so active and the air was so close. We both got up and walked on the verandah a long time between two and three o’clock….Then I had a little dreamy sleep….When it was a little light came up to my own room, bathed, and rested a little on my own bed, free of the fleas. This was decidedly the most unpleasant night I have spent in Japan. But all day the prayed for, needed rain has been falling, and the tribulations of the night are forgotten. A shock of an earthquake more severe than usual as we were preparing to retire. Sept. 1: Mr. Thompson has just been in. A little account of his preaching in Yokohama yesterday and the varieties of his stay. I am so glad to see him better. We will not see each other so often as we have been doing lately, and I am better satisfied to have it so. Peace and inconsistency cannot dwell together….Mrs. Carrothers’ school begun today. Page from Mary Parke Thompson's diary, Aug. 26, 1873. Sept 3: Yesterday afternoon got my room furnished with all my own things. Feel quite satisfied with the result….My first scholar called again this morning. He had with him a copy of Pilgrim’s Progress. Was reading it he said. He told me he read in the Bible when he could. Have I not prayed for him, have I not written to friends who have prayed for him, and should I not expect his conversion. “Lord increase our faith”. He went away saying, “I will never forget you”. I think God would have my faith made stronger by the way this boy has acted. Sept 4: A day much like all other days. A little walk with Mr. Thompson after breakfast—with my teacher till noon—Writing till after four o’clock—A Japanese woman with her present of fruit and a little girl lengthened their call till nearly six—After dinner, a long pleasant walk and talk with Mr. Thompson in the bright moonlight. Now returned to note down that we talked of our old homes. And then on of the high joys of free glorified spirits and of heaven a certain home. In the uncertainties I have peace and thank God. Sept 7: Sabbath. A wonderful day! A day that is an era. The first Sab[bath] of the month, Communion Sab[bath], and a leading of some souls from darkness and anxiety out into light and joy and peace….The mail came yesterday evening bringing me pleasant letters and good papers. It brought to Mr. Thompson the source of all this gratitude and joy. He was in yesterday evening, but I did not see him alone. I was content to read in his face relief and happiness. The revelation was reserved for this blessed day, that it might be the era. Another wonderful element in this day, too, was the sermon Mr. Thompson preached. Text. Heb. 11.17. We can utter no truth with such power as that which ourselves have lived. A day ever to be remembered! “My soul and all that is within me be stirred up to bless and magnify His holy name”. Sept 8: A ride in a pleasant little roofed boat up the river. All the afternoon spent. Little seen, much heard and thought. And I am wholly his, and he is wholly mine, and we are both God’s grateful, loving children, more desirous of serving and obeying him than ever in our lives before. A world of calm content and happiness! But Oh! How deeply dyed in sin is this people! Let us not be idle. Labor will be so lightened as we go on together. Two of my boys came again to see about school this morning. As I knew nothing definite told them to come tomorrow. 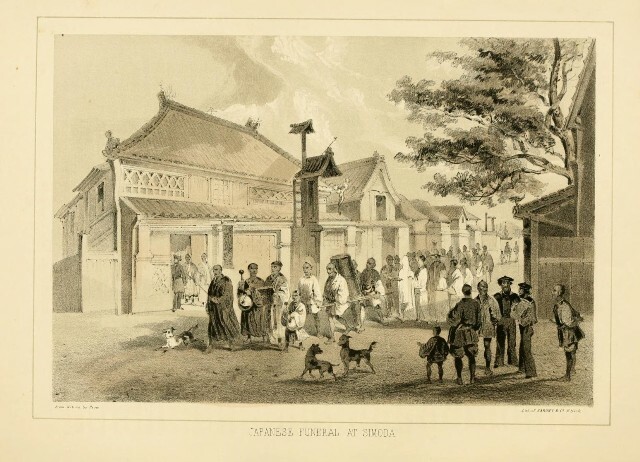 Japanese Funeral, from "Narrative of the expedition of an American squadron to the China Seas and Japan[...] under the command of Commodore M.C. Perry, United States Navy[...]." Washington D.C.: A.O.P. Nicholson, 1856, p. 426. Sept 9: Told the boys that I would begin teaching them next Monday—A talk with my teacher today on Japanese wearing mourning for the dead. Only the higher classes observe this custom. They wear white instead of black and for a period of fifty or one hundred days. It is customary for friends to come and condole with them during this period. I am beginning to enjoy very much the reading of the New Testament with her. Evening spent with Mr. Thompson. He has been in Yokohama today to consult about the organizing of a native church here. A pleasant and harmonious conference with the members of the mission there. Mr. Carrothers not agreeing with their views here. Miss [Kate] Youngman’s future some care to us. But our own lives and future now deeply absorbing. We knelt down together and asked God’s blessing on our love and our united lives, directed as we think all has been by himself, then most earnestly and surely, for aught that we know, each was given away to the other. Tender feelings, tender loving words! We part to go and pray each alone over the matter. Sept 10: When Mr. Thompson came over to prayer meeting, he brought us each a copy of the little Catechism translated in Yokohama. Sept 11: The evening spent with Mr. Thompson. After unitedly asking God’s direction we talked of our future. Ah, what gladness it is to me that such a dear, considerate, sensitive, loving soul is given me, beside whom I may toil and if need be, suffer. Sept 12: A rainy morning. My teacher seems very faithful. She came through it all, though late. Her appearance recalled the beautiful tortoise-shell ornaments she brought with her yesterday to sell, but they were too costly for my slender purse. The Presbyterian Historical Society received the Thompson Papers in 2011, a collection that includes Mary Parke Thompson’s seven handwritten diaries. PHS volunteer Sue Althouse, herself a retired missionary to Japan, has been processing the Thompson Papers, and she has chosen excerpts from Mary’s diaries to share with readers. To see other excerpts, visit http://www.history.pcusa.org/about/blog and select the Mary Parke Thompson tag from the right hand menu. Posts will then be displayed in reverse chronological order. Mary had gone to stay in Yokohama during the absence of Presbyterian missionaries Christopher and Julia Carrothers. David Thompson had probably written to the Presbyterian Church in the U.S.A. Board of Foreign Missions to inform the Board that he and Mary wanted to get married. David Thompson apparently received a letter from the Board of Foreign Missions stating that the Board would financially support David and Mary Parke as a married couple.